AKIPRESS.COM - A gay rights and women's rights activist in Kazakhstan has been fined for taking part in a provocative photoshoot that she says was aimed at raising awareness about a taboo subject in Kazakhstan -- menstruation, RFE/RL reports. 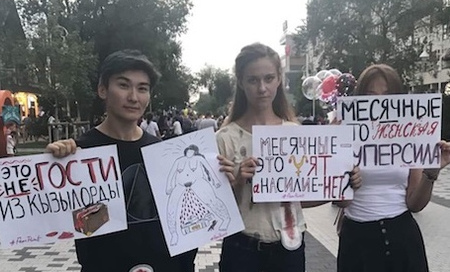 Sekerbaeva, a member of the Kazakhstan-based gay rights and women's rights group Feminita, took part in the August 9 photo shoot on the streets of Almaty -- holding up a drawing of a woman menstruating over a group of traditional nomadic houses known as yurts. Amnesty International had urged Kazakh authorities on August 16 to "immediately end proceedings" against Sekerbaeva.